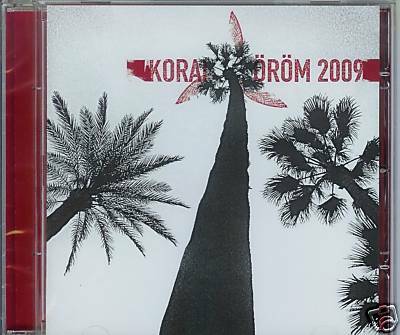 It has been 4 years since Korai Öröm has released a record. Rumour was that an official DVD was coming out but I don’t think is has. I know that band has probably 20 hours of great live video. Anyway, the band has finally decided to give their songs names, which makes it easier for you and me. The band has the old female singer from Ole Lukkoye singing on two tracks. The CD begins with New Arabian and this track is very cool but will remind you of an older track by the band that they called on their set lists, Arab. This track features Tatjana has an amazing, mystical voice that goes perfectly with the track which slowly builds up. Deep bass… Twelve Forth begins with some delay guitar before the percussion kicks in. The track reminds me a lot of the Hungarian band Colorstar. I think one of the guitar players also plays in that band. Chinese is next and begins with some spoken words by John de Ruiter as the spacey track slowly builds up with nice delay guitars and spacey sounds and a great rhythm that just builds and builds till the end of the track. Floating is the longest track at 11 minutes and again features the amazing voice of Tatjana. It begins very spacey and develops into an amazing track. Mbira is a short track with a low fi sound and harpsichord like backing track with some flutes. The Peasant Strikes back starts off in a very strange way and features some strange samples and a cool gypsy singer. Very weird and a real techno like trance rhythm on this one once it gets going. Subaru is one minute track sung like an African inspired track. Latin starts off with a flute solo that sounds like Loser by Beck. This track has an infectious groove. The CD ends with Acoustic.. 3½ minutes, just like the names says. Overall, this CD really goes back to the roots of the bands sound in the 90’s and away from the more slick, commercial world music the band had produced over the last 3 CDs. I think all fans of the music will like this though. Great CD. Hope we don’t have to wait 4 years for the next one!